Whether you want to sit a spell and enjoy nature, or burn off some extra energy, you’ll find opportunities all around you at Papa’s Pumpkin Patch! Most activities are free; some are only available on weekends and Thursday evenings. Be sure to check below to catch the details. 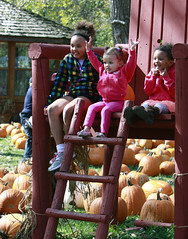 FREE ACTIVITIES (all week, 12-7 pm): Infamous Bale Mazes, Slide Mountain, Touchstone Nature Trail, Log Jam, Great Pumpkin’s Chair, Corn Cribs, Billy Bob the Cornstalk Horse, Papa’sville (wooden play structures), How Tall This Fall?, Mr. Antique, Wee Zips, Swings and More Swings, Tire Climbing Pile, Super Sandbox, slack lines and rope tunnels, human foosball and the corn maze. You can also visit with Jesse and Kit, the horses! 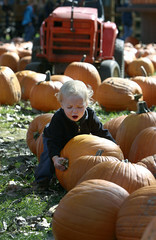 FREE ACTIVITIES (Saturdays and Sundays — 12-5 pm; Thursdays — 5-7 pm): Special O Trebuchet, Pumpkin Cannon. 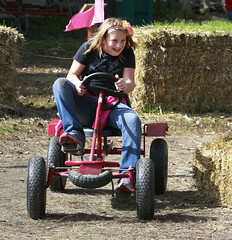 ACTIVITIES WITH A SMALL FEE (Saturdays and Sundays — 12-6 pm and Thursdays — 5-7 pm only): Horse-Drawn Hayrides ($2/person), Pony Rides ($4/person), Zip Lines ($1/zip), Sebastian’s Barrel Train ($1/person), Monster Wagon Rides ($1/person), Papa’s Pedal Carts ($1/ride), Corn Cob Sling Shots ($1/3 cobs) and the side-by-side Obstacle Course ($1/person). CONCESSIONS (all week, 12-7 pm): variety of hot and cold beverages, Papa’s famous pumpkin cookies, pumpkin pie and other munchies. 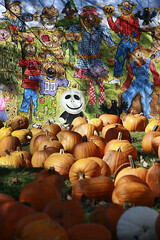 JOJO’S GIFT STORE (12-7 pm daily): find a wonderful variety of fall-themed decor, Papa’s Granola and the popular children’s book Every Pumpkin Is Perfect. Zip Lines: The zip lines at Papa’s are one of our guests’ favorites. They are a perfect chance to fly through the air and try something different. (Sat-Sun, 12-6 pm, Thurs, 5-7 pm, $1/zip) Please Note: Papa also offers Wee Zips for tiny tots and they are free.